With Martin Samuel named as Sports Writer of the Year for a record-equalling sixth time, the Daily Mail’s sports desk crowned an outstanding evening at the SJA British Sports Journalism Awards, sponsored by BT Sport. 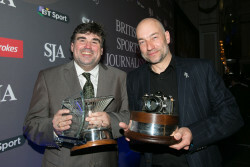 The Mail took a total of four top prizes, including the Sports Newspaper of the Year for a second time and Sports News Picture for the work of their staff photographer, Graham Chadwick. The Sports Photographer of the Year was named as Adrian Dennis, the AFP snapper taking the cherished Ed Lacey trophy for a second time in three years, after he had earlier been named as the winner of the Sports Portfolio Award. And in a year when the SJA expanded its awards to include a fuller range of sports broadcasting prizes, there was widespread acclaim in the dining room at the Grand Connaught Rooms in London’s Covent Garden when Mike Ingham, the recently retired BBC Radio football correspondent, was named as the recipient of the Doug Gardner Award for services to sports journalism. 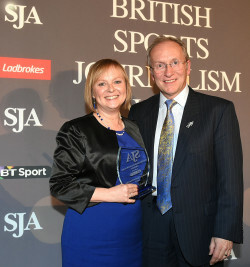 One of Ingham’s former BBC colleagues, Eleanor Oldroyd, scooped the award for Broadcast Sports Presenter of the Year, in a category where the highly commended entries were submitted by Gary Lineker and Hazel Irvine. The judges said Lineker and Irvine were “beaten to this award by an outstanding broadcaster with a wonderful range, both in the studio and on Outside Broadcasts…” whose “use of language and description is excellent and that they are a good and sympathetic interviewer who champions many of the lesser and sports but is equally adept at handling the big occasion”. Samuel has dominated the John Bromley Trophy award for the nation’s leading sports writer over the past decade, whether working for the News of the World, The Times or now at the Mail. The winner in 2005, 2006, 2007, 2010 and 2013, tonight’s win puts him on level terms with Hugh McIlvanney and one ahead of Ian Wooldridge; between them, McIlvanney and Wooldridge shared the first Sports Writer of the Year Award in i976. The Young Sports Writer of the Year Award is named in honour of Samuel’s predecessor as Mail columnist, Ian Wooldridge, and in winning this prize, James Gheerbrant – with a portfolio drawn from work at BBC Sport and The Times – showed himself definitely one to be watched: it is just a couple of years since Gheerbrant, then an undergraduate, was winning the Student Sports Writer prize at these awards. The Sports News Reporter of the Year category saw three of Samuel’s colleagues short-listed, with Matt Lawton emerging triumphant ahead of the highly commended Martyn Ziegler of the Press Association and the Telegraph’s Nick Hoult. It was Lawton’s work on the emails and text messages sent by Malky Mackay when he was manager at Cardiff City which swung the prize Lawton’s way. The judges said that Lawton’s work “set the football agenda for weeks and still has major ramifications for the sport, as the reporter demonstrated good, old-fashioned news-gathering by obtaining some dynamite and damning documents”. The Laureus Sports Website of the Year went to The Guardian for “digital innovation, great journalism, industry-leading design and its approach to social media”. Getty Images photographer Gareth Copley added to the many plaudits for his work in cricket when he won the 2014 Phil Sheldon Trophy for Specialist Sports Portfolio, ahead of the Racing Post’s Ed Whitaker and freelancer Steve Etherington. The new, and fiercely contested, Football Writer of the Year award was won by the Daily Telegraph’s Henry Winter, with Daniel Taylor (The Guardian) and Rory Smith (The Times) highly commended. In a year of a football World Cup and a thrilling F1 season, the award for Television Sport Live Broadcast went to BBC Sport for their coverage of the Glasgow Commonwealth Games. The Ladbrokes Specialist Correspondent recognises excellence in coverage of a sport, other than football, rugby or circket, and this category gave the judges more than 200 articles to review each. After their careful deliberations, the winner was a freelance golf writer, Paul Mahoney, ahead of Alan Lee, the racing correspondent of The Times, and another golf specialist, James Corrigan of the Telegraph. The judges said that “the winner’s reports are full of insight and colour, making them such an entertaining, appealing read, even to the non-golfer. His turn of phrase gives him the edge in a highly-competitive field”. The Scoop of the Year pitched two of the winners from earlier in the evening against one another, Matt Lawton against the Sunday Times’s Insight team of Jonathan Calvert and Heidi Blake, with the judges’ decision going to the latters’ Fifa Files for a “comprehensive dossier on a corruption scandal that has more legs than a centipede”, which they described as “stunning journalism – a huge story brilliantly presented and made possible by exhaustive research and relentless investigation”. Each year since 1989, the Doug Gardner Award has been presented by the SJA for services to sports journalism. In a quarter of a century, it had never been presented to someone who worked primarily in sports broadcasting. Until this year. On an awards evening when the SJA introduced a fuller range of broadcast categories, that omission was put right, with Mike Ingham recognised for his career’s work… only for him to deny that it was a “career”, and to dedicate his award to his predecessors and mentors, Bryon Butler and Peter Jones. The recently retired BBC football correspondent, Ingham is held in such high esteem among his sports writing, photography and broadcasting colleagues that when his name was announced at the British Sports Journalism Awards, sponsored by BT Sport, by SJA Chairman David Walker, it drew a standing ovation from the 400-or-so members and guests in the dining room at the Grand Connaught Rooms. 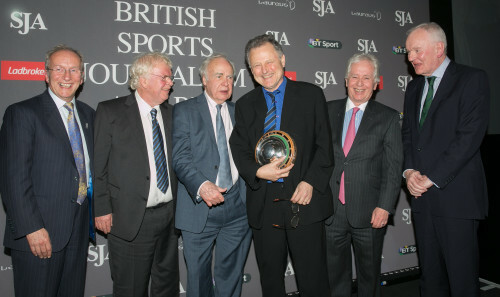 Flanked by an SJA “guard of honour” comprising Jeff Powell, James Lawton, Hugh McIlvanney and Patrick Collins, Walker said, “The Doug Gardner Award salutes a lifetime achievement by a SJA member. As you’ve seen tonight, the SJA is a broad church and we consider potential winners from newspaper journalists and photographers. “But we have never before presented the Doug Gardner Award to a broadcaster. “This year’s winner is acknowledged as one of the greats of his profession. A man whose professional success and reputation has never affected his fundamental openness and modesty. “He’s had a long career. Just part of his remit was to cover the England football team and he had to work with 11 different England managers. “Those of us who worked with him or travelled the world in his company felt privileged to have him as a colleague and a friend. “Football managers who worked with this journalist all respected his professionalism, the way he went to see them before the game to gauge their ideas and tactics. And they also respected the way he constructively criticised them and their teams when performances weren’t good. “In terms of radio broadcasting I’d suggest Mike Ingham should be rated right up there with his illustrious predecessors Bryon Butler and Peter Jones. 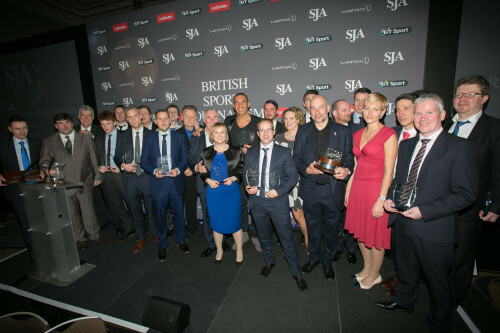 Here is the complete list of all winners and highly commended entries at the 2014 SJA British Sports Journalism Awards, sponsored by BT Sport and supported by the Laureus Foundation and Ladbrokes, staged in London on March 23, 2015.